Minnesota's Apollo 11 lunar sample display, seen here, was found in storage at the Veterans Service Building in St. Paul. It is being transferred to the Minnesota Historical Society. Five small fragments of the moon, which were collected at Tranquility Base 40 years ago and gifted to the people of Minnesota, have been found by the National Guard. 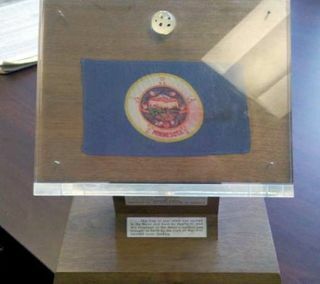 The small lunar stones, which are better described as dust and pebbles rather than moon rocks, were discovered as they were originally presented: embedded inside an acrylic button and mounted to a wooden podium with a Minnesota state flag that also flew to the moon in 1969. "The Apollo 11 moon rocks were found amongst military artifacts in a storage area at the Veterans Service Building in St. Paul," said Army Maj. Blane Iffert, the former state historian for the Minnesota National Guard. The Minnesota moon rocks are one of approximately 185 such lunar sample displays that were presented to each of the states, United States' territories and to foreign nations as a goodwill gesture following the return of the Apollo 11 crew, Neil Armstrong, Buzz Aldrin and Michael Collins. Minnesota's Apollo 17 goodwill moon rock is displayed by the state's Historical Society in St. Paul, where the Apollo 11 display will be transferred on Wednesday (Nov. 28). "We are honored to have this in our collection to preserve for future generations," Pat Gaarder, Minnesota Historical Society deputy director, said in a statement announcing the pending delivery of the Apollo 11 moon rocks. "Space exploration is an important part of our shared history. It is also exciting to think that our collection includes artifacts from across the globe and now with these moon rocks, the galaxy." The six Apollo missions that landed on the moon returned a total of 842 pounds (382 kilograms) of lunar material to Earth. The goodwill gifts, which weigh between 0.05 grams (Apollo 11) and 1.142 grams (Apollo 17) represent in total less than half of one pound (220 grams) of the moon rock brought back by the astronauts. This image shows an Apollo moon rock sample (catalogued as 10020,234) in the Lunar Sample Laboratory at the Johnson Space Center, Houston. "When I searched the internet to find additional information about the moon rocks, I knew we had to find a better means to display this artifact," Iffert said. "It is stated on some websites that approximately 180 [sample displays] are currently unaccounted for of the 270 moon rocks from the Apollo 11 and Apollo 17 missions. We've just lowered that number by one." The effort to catalog the present whereabouts of each of the gifted moon rocks — the only astronaut-returned lunar samples ever given away by the U.S. government — has been led by collectSPACE.com since 2002. NASA closely tracks its own lunar material holdings but as the goodwill rocks are no longer federal property, it has fallen to private efforts to find the state and foreign nation-owned samples. Working with the public, museum staff, and in particular, graduate students at the University of Phoenix led by their professor Joseph Gutheinz, a former NASA special agent, the collectSPACE "field guide" to the Apollo 11 and Apollo 17 moon rocks has successfully located more than 170 of the displays. Of the Apollo 11 samples that were gifted to the 50 states, 11 remain missing, including the lunar pebbles presented to Massachusetts, New York, Texas and Virginia. Eight of the states' Apollo 17 goodwill moon rocks have not been located, including those in Kansas, New Jersey and Ohio. That Minnesota's moon rocks turned up in storage is not too surprising given how many of the gifts that have been found to date have surfaced. The lunar sample displays were originally intended to be placed on public display, and in many cases they were. But others were held in state officials' offices, or were only part of temporary exhibits. As the years passed, the rocks migrated into former governors' archives and homes, put into boxes and forgotten or otherwise disregarded. In Nebraska, the state's Apollo 11 moon rocks were lost in the governor's mansion for several years, only to turn up during renovations. In Hawaii, they were locked inside a cabinet until a routine inventory revealed them. In Delaware, the moon rocks' button-shaped acrylic was stolen in 1976 "right off its display plaque," which remains in state property. And in Alaska, a fire reportedly offered the opportunity for a then-teenage future reality TV star to take the rock from the debris. A court order has returned the lunar sample to NASA pending its authentication and a judge's ruling. The search has been even more difficult outside the U.S., where language barriers, geography hurdles, and differing laws have further complicated finding them. A few of the foreign-gifted moon rocks, like Malta's Apollo 17 sample, have been reported as stolen, while others may be exactly where they are supposed to be but cannot be labeled as "found" until someone sets eyes on them and reports their location. See collectSPACE.com for the “field guides” to missing moon rocks: Where Today are the Apollo 11 Lunar Sample Displays? and Where Today are the Apollo 17 Goodwill Moon Rocks?